A story in EMAILS about bullying in Junior High. Two cool kids at different high schools find themselves confronted by very different types of bullies. 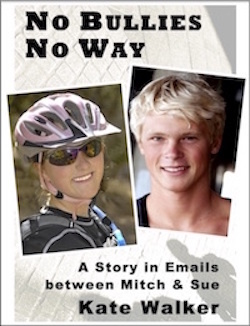 Surfer Mitch and mountain-biker Sue exchange very personal emails on matters that are fast spiraling out of control. Sue finds herself being bullied by another girl at her new school. Meanwhile Mitch and his mates are increasingly threatened by tough-guy Jim & his gang. Can a bully be halted? At great cost to themsevles, this pair search for a way.